Dual Economies: The Developing Storm - Epoch Investment Partners, Inc. 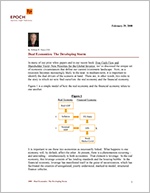 In many of our prior white papers and in our recent book, Free Cash Flow and Shareholder Yield- New Priorities for the Global Investor, we’ve discussed the unique set of economic circumstances that define our current investment landscape. Now, as a recession becomes increasingly likely in the near- to medium-term, it is important to identify the dual drivers of the scenario at hand. There are, in other words, two sides to the story in which we now find ourselves: the real economy and the financial economy. Figure 1 is a simple model of how the real economy and the financial economy relate to one another. It is important to see these two economies as necessarily linked. What happens in one economy will, by default, affect the other. At present, there is a phenomenon occurring – and unwinding – simultaneously in both economies. That element is leverage. In the real economy, this leverage consists of lax lending standards and the housing bubble. In the financial economy, leverage has manifested itself in the guise of securitization, which has facilitated the creation of unregulated, poorly understood, marked-to-model, structured finance vehicles. With hindsight, the corrosive power of this two-sided leverage could be seen as early as 2003 and certainly by 2006. The following pages will examine the past, present and future of the leverage-oriented weaknesses in both the real and financial economies, and will offer an investment strategy to preserve and grow capital during these times of uncertainty. The actions of the Central Bank, which, in reaction to the stock market decline of 1999-2001 and driven by a fear repeating Japan’s mistakes, established extremely easy monetary conditions. The birth and rapid growth of new unregulated financial products with strange acronyms, poor transparency of structure, and an absence of regulation. The ability and incentive to deploy massive use of leverage across a global financial system, resulting in financial security values (bonds and stocks but not derivatives) over three times the value of global GDP. What does each point in the previous list have in common? The prevalence of leverage. And this leverage quickly manifested itself in the formation of the housing bubble, i.e. the epicenter of the current weakness in the real economy. Using this and other data, our book went on to state that further evidence of the bubble’s enormous magnitude could be seen in the diverging relationships between housing prices and rents. The ratio of housing prices to rents can be thought of as a P/E ratio of sorts for the housing market. In America, this ratio has never been higher. At the time of our book’s publication, this ratio was 35% higher than the average for the period 1975-2000. It was even higher in Britain, Australia, and Spain. Figure 2, which shows the spike in inflation-adjusted housing prices, is indicative of the housing bubble’s formation and its inevitable demise. While it is difficult to determine the magnitude and timing of the housing crash, it is possible to identify a possible range of outcomes. Many analysts are now predicting peak to trough declines of 20% to 30% for housing values. Year over year declines approaching 10% have already occurred, which is a critical factor in measuring the so-called wealth effect on consumer spending from a substantial decline in housing values. Economists often use a range of 6¢ to 9¢ per dollar of wealth gain or loss to measure the impact on consumer spending. Figure 3 does the math and calculates the impact on GDP. With consumer spending in the U.S. at 72% of GDP, or just over $9 trillion, consumer spending would be impacted 3-4% with a 20% decline in housing prices in one year. Compare this 3-4% estimate to the data in Figure 4, which provides a 77 year history of annual changes in consumer spending. Regarding Figure 4, a few observations can be made. First, these are nominal numbers and reflect inflation; hence, the high numbers in the 1970’s. Secondly, since WWII, the numbers have always been positive and rarely below 4% year over year. In 2008, however, I believe we will see a number well below 4%, possibly as low as 2%. Figures 5 and 6 display this century’s build-up in leverage at the household level, placing the debt price in perspective and further reinforcing the potential impact on consumer spending. Figures 5 and 6, however, only tell part of the story of our country’s overall indebtedness. It is no longer just housing debt that plagues the American consumer, but also auto loans and credit card debt, each of which is subject to further contraction. Until 2008, the American consumer continued to spend more than he earned, piling up debt and utilizing cash from mortgage equity withdrawals. Now, those days are long gone. For the first time in many years, the consumer will have to spend within his income levels while his balance sheet shrinks. It will take many months, not weeks, to fully gauge the depth and duration of this change in consumer spending. And while the government’s stimulus package will help, it will not do so until much later in the year and, in our view, will offset no more than one percent of GDP. In the financial economy, the subprime mortgage collapse has been the source of a large and growing leverage burden, mostly evident within the banking system. The subprime mortgage crisis, once dismissed by many pundits as insignificant to a $12 trillion economy, is now crippling financial institutions around the world. Structured finance mechanisms have multiplied a $300-400 billion problem into over $1 trillion of vulnerable capital. Counter-party risk among the banks rose throughout 2007, as evidenced by LIBOR premiums that are now just beginning to ebb. As a result of sub-prime related woes, sovereign wealth funds have been injecting capital into the investment banks: a phenomenon which is now the rule rather than the exception. And the industry itself is fully cognizant of the severity of their predicament. UBS has stated that this crisis is the largest failure of risk management ever in the capital markets. Imagine, for example, where Merrill Lynch would be had they not purchased BlackRock or received outside capital. Much of the subprime debacle owes itself to regulatory failure, particularly in the rating agencies such as Moody’s and S&P. It was their collaboration with investment banks that produced more AAA rated paper than corporate AAA bonds, and their “marked-to-model” ratings dangerously obscured the risks inherent in unconventional investment vehicles. Furthermore, due diligence was abandoned as the security’s originator was separated from its ultimate owners. Regulatory oversight became virtually nonexistent, either through neglect or through an absence of authority to regulate. If the latter is to blame, Congress is sure to take action. The leverage burden in the financial economy has taught us what it means to separate the origination of security from its ultimate owner. As due diligence is neglected, the systematic risk within the asset class rises sharply. Now, we are witnessing the fall-out. Since 2006, 225 major U.S. lending operations have imploded. Considering how the two sides of the leverage story have impacted both the real and financial economies, we recommend the following investment strategies. For debt investments, we recommend shorter durations, a focus on high quality, a ladder portfolio with maturities of 2 to 7 years, and an avoidance of junk bonds. For equity investments, it will be crucial to identify companies that generate free cash flow, have little or no debt, and possess management that can wisely allocate capital usage and take advantage of the strategies and opportunities that will arise over the next 12-18 months. Similarly, investors should strive to develop new concepts of value and growth surrounding cost of capital analysis inside the free cash flow prism, including the concept of “Shareholder Yield,” the importance of which will be validated in the upcoming environment. Of equal value will be the identification of global opportunities to take advantage of the Law of Comparative Advantage. Along these lines, it will behoove investors to explore “game changing” concepts, such as country-centered investment opportunities (e.g. Brazil), and risk reduction strategies that make portfolios more efficient (i.e. same return expectation with lower dispersion measures). We believe, therefore, that even if both sides of the story seem grim, we can still benefit from a close and detailed understanding of the plot. As the recession takes hold, it will become increasingly important to recognize the presence of leverage within the dual economies, and to adhere to an investment philosophy that will acknowledges its impact going forward. 1This was how the rating agencies aided and abetted the investment banks in the sub prime crises.